Larry Bossidy is one of the world’s most acclaimed CEOs, a man with few peers who has a track record for delivering results. Ram Charan is a legendary advisor to senior executives and boards of directors, a man with unparalleled insight into why some companies are successful and others are not. Together they’ve pooled their knowledge and experience into the one book on how to close the gap between results promised and results delivered that people in business need today. After a long, stellar career with General Electric, Larry Bossidy transformed AlliedSignal into one of the world’s most admired companies and was named CEO of the year in 1998 by Chief Executive magazine. Accomplishments such as 31 consecutive quarters of earnings-per-share growth of 13 percent or more didn’t just happen; they resulted from the consistent practice of the discipline of execution: understanding how to link together people, strategy, and operations, the three core processes of every business. Leading these processes is the real job of running a business, not formulating a “vision” and leaving the work of carrying it out to others. 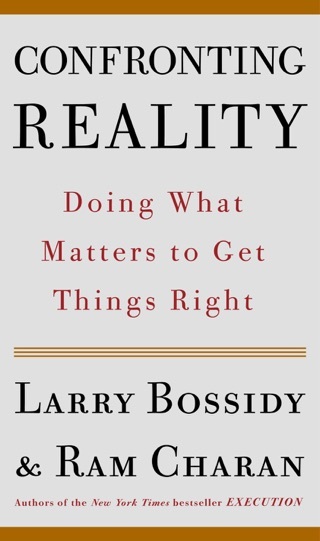 Bossidy and Charan show the importance of being deeply and passionately engaged in an organization and why robust dialogues about people, strategy, and operations result in a business based on intellectual honesty and realism. The leader’s most important job—selecting and appraising people—is one that should never be delegated. As a CEO, Larry Bossidy personally makes the calls to check references for key hires. Why? With the right people in the right jobs, there’s a leadership gene pool that conceives and selects strategies that can be executed. People then work together to create a strategy building block by building block, a strategy in sync with the realities of the marketplace, the economy, and the competition. Once the right people and strategy are in place, they are then linked to an operating process that results in the implementation of specific programs and actions and that assigns accountability. This kind of effective operating process goes way beyond the typical budget exercise that looks into a rearview mirror to set its goals. It puts reality behind the numbers and is where the rubber meets the road. Putting an execution culture in place is hard, but losing it is easy. In July 2001 Larry Bossidy was asked by the board of directors of Honeywell International (it had merged with AlliedSignal) to return and get the company back on track. He’s been putting the ideas he writes about in Execution to work in real time. How do you turn a company's strategy into reality? As the failure to execute that has plagued firms from Aetna to Xerox shows, this is no small question. In fact, Honeywell International chairman Bossidy and consultant Charan (What the CEO Wants You to Know) argue convincingly that the inability to turn goals into reality what they call "execution" is the biggest problem organizations face. They begin by placing the blame squarely at the feet of senior managers who incorrectly believe that all aspects of execution can be delegated. In systematic fashion, they present "building blocks" that leaders can use to make successful execution an inherent part of a company's culture. Managers need to set clear, realistic goals; help workers reach those goals by supplying sufficient resources and coaching; and hold employees accountable if they fail while rewarding them handsomely if they succeed. Leaders must know their employees and their business, the authors say, because being "detached and removed and absent" will only alienate them from employees. 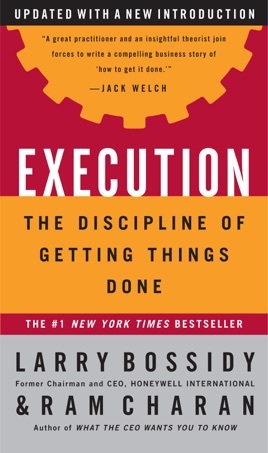 Citing examples from Lucent, GE, AT&T and other organizations, Bossidy and Charan offer dead-on assessments of executions gone right and wrong. The book clearly delineates which author is speaking when, and while Charan's ideas are interesting, Bossidy's are persuasive. As the Honeywell veteran says, "You can't just say ma ana. You've got to have a plan that both plants seeds and harvests." 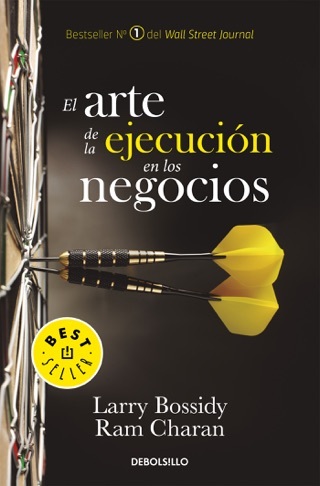 This is a terrific book that will make smart managers rethink how business gets done within every level of their organization or department. If this is what it takes to "get ahead" in the business world then count me out. One of the many tails discusses a division manager who had unparalleled accomplishments and took a division from third to first in the marketplace was determined to be unlikely to take the division to the next level so they fired him. That is cold and if a stone cold heart is what is needed to be an executive in a company then I want nothing to do with it.